Our Righteous Father Jacob of Nisibis, also James of Nisibis , Jacob the Great , Jacob of Mygdonia ,[note 1] or Mor Ya`qub , called the "Moses of Mesopotamia" for his wisdom and wonderworking abilities, was the second bishop of Nisibis,[note 2] spiritual father of the renowned Syriac writer and theologian Ephrem the Syrian, celebrated ascetic and one of the 318 fathers of the First Ecumenical Council at Nicaea. Jacob was born at Nisibis (Antiochia Mygdoniae) towards the end of the third century, the son of Prince Gefal (Armenia). By some accounts he is said the have been nearly related to his contemporary Gregory the Illuminator, the Apostle of Armenia. [note 4] According to St. Eugene (Augin),[note 5] the Venerable St. Jacob came from the tribe and the family of St. James the brother of the Lord. At an early age he devoted himself to the life of a solitary, practicing the severest self-discipline. [note 6] He liked the solitude and the peace of the desert, and he lived in the mountains around the city of Nisibis, on the border of the Persian and Roman empires. In the summer he lived in crevices of the mountains, and in the winter he lived for a short time in a cave. His food was not what he had sown, but what grew there on its own, such as fruits from wild trees and green plants that grew in the desert. His clothing was made of hard goat's hair. He always fed on spiritual food which came through prayer which also kept his thoughts pure. Through his asceticism, he gained a deeper connection with God. He had the gift of foresight, and by the grace of the Spirit, he received the gift of miracles. His contemporary St. Eugene (Augin) was a native of Egypt, who later retreated to Mount Izla near Nisibis, in order to do his missionary work there. At that time, there were many heathens and Marcionists and the fear of God was lost by many. Together, these two great saints worked many miracles and healings, and they baptized many who professed the true faith. During this period of his life he went on a journey to Persia for the purpose of confirming the faith of the Christians there, who were enduring persecutions under Shapur II. Theodoret records several miracles as taking place at this time. In addition, Gennadius reports that Jacob was a courageous confessor during the Maximinian persecution as well. 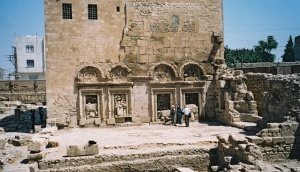 The newly excavated Church of Saint Jacob in Nisibis. After leading a severe life in the mountains of Kurdistan with St. Eugene (Augin), the founder of Persian monasticism, he became the second bishop of Nisibis in 309. Upon the vacancy of that see, which was his native city, Jacob was compelled by the demand of the people to become their bishop. He was then forced to exchange his desert life with life in the city. Although he moved to the city, he changed neither his food, nor his asceticism, nor his simple clothing. In his new position, he worked especially to help the oppressed, those in need, orphans, widows and the poor, for he was moved by awe and holy fear of Jesus, our Lord and Saviour. In 313 he began to build the great basilica in Nisibis, the ruins of which still bear his name. As bishop of Nisibis, Jacob was the spiritual father of Ephrem the Syrian, who was baptized by him and remained by his side as long as he lived. The Bishop of Susa, Milles (Milas al-Razi), when visiting Nisibis to attend a synod for settling the differences between the bishops of Seleucia and Ctesiphon, ca. A.D. 341, found Jacob busily engaged in erecting his cathedral, towards which, on his return, he sent a large quantity of silk from Adiabene. In 325 Jacob was summoned to the Council of Nicaea. A leading part is ascribed to him by Theodoret in the debates of that council, as the champion of the whole Orthodox faith. [note 8] He is commended by Athanasius, together with Hosius, Alexander, Eustathius, and others. According to some Eastern accounts of the council, Jacob was one of those whom the Emperor Constantine marked out for peculiar honour. Nicephorus also adds, that similar to Paphnutius of Thebes, he was noticeable at the Council due to the the seams and scars left by his sufferings; Theodoret however is silent on this point. Abraham Ecchellensis ascribed to him the compilation of the eighty-four Arabic Nicene canons, the spuriousness of which has been sufficiently proved. His name also occurs among those who signed the decrees of the Council of Antioch "in Encaeniis" in A.D. 341, of doubtful authenticity, since no mention of his being present at this council occurs elsewhere. Later Bishop Jacob was present at the dedication of the Church of the Holy Sepulcher in Jerusalem, on September 14, A.D. 335. No writings of Jacob of Nisibis are known, although he has been confused in the past with the fourth century Persian writer Aphrahat (ca.270-ca.345), who was the head of the monastery of Mar Mattai, near modern Mosul, with the rank of bishop and, apparently, the episcopal name Jacob, who composed a series of twenty-three expositions or homilies on points of Christian doctrine and practice. [note 10] The author of the homilies, who was earliest known as "the Persian sage", was a Persian subject, and tells us that he took the Christian name Jacob at his baptism. Hence he was already confused with Jacob of Nisibis by the time of Gennadius (before 496),[note 11] and the ancient Armenian version of nineteen of the homilies was published under this latter name. Theodoret, from whom we obtain the amplest detail of his life, does not speak of his writings. And Jerome, who mentions him in his Chronicon, does not notice him in his book De Viris Illustribus. The most famous miracle of St. Jacob was that by which he protected the city of Nisibis from the Persians, as is related by Theodoret both in his religious and ecclesiastical history, by Theophanes, and even by Philostorgius himself, who was a rank Arian, and cannot be suspected of being too favourable to St. Jacob. After Constantine the Great died in the year 337 and his sons had taken over the kingdom, the Persian king Shapur II (309-379) besieged Nisibis three times over, during his war against the Romans. [note 13] St. Jacob and St. Ephraim prayed with the people in the church each time, asking God to help them. The bishops' intercession during the final siege in 350 saved the city:[note 14] Theodoret offers a particularly vivid picture of his contribution to the defence of the fortress. At the urging of Ephraim and the rest of the inhabitants he ascended the walls of Nisibis to pray for them and curse the Persians. The bishop would not pray for the destruction of any one; but he implored the divine mercy that the city might be delivered from the calamities of so long a siege. Afterwards, going to the top of a high tower, and turning his face towards the enemy, and seeing the prodigious multitude of men and beasts which covered the whole country, he said: “Lord, thou art able by the weakest means to humble the pride of thy enemies; defeat these multitudes by an army of gnats.” God heard the humble prayer of his servant, as he had done that of Moses against the Egyptians, and as he had by the like means vanquished the enemies of his people when he conducted them out of Egypt. For scarcely had the saint spoken those words, when whole clouds of gnats and flies came pouring down upon the Persians, got into the elephants’ trunks, and the horses’ ears and nostrils, which made them chafe and foam, throw their riders, and put the whole army into confusion and disorder. A famine and pestilence which followed, carried off a great part of the army; and Sapor, after lying above three months before the place, set fire to all his own engines of war, and was forced to abandon the siege and return home with the loss of twenty thousand men. 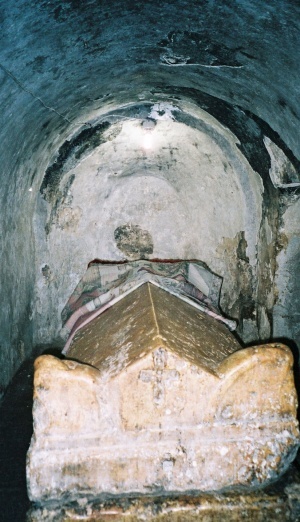 The tomb of Saint Jacob in the crypt of his church in Nisibis. Around A.D. 350 St. Jacob founded the School of Nisibis, after the model of the school of Diodorus of Tarsus in Antioch, in which he himself was an instructor. Through the Holy Spirit he had a strong and holy influence on the hearts of his students. When the Persians conquered Nisibis in 363, the School was moved to Edessa and re-establised there by St. Ephrem the Syrian, where it operated from 363–489. The Venerable Bishop Jacob died peacefully in Nisibis, according to some in A.D. 338, and according to others in A.D. 350. He was honourably interred within the city, in pursuance, it is said, of an express charge of Constantine the Great to his son Constantius, indicative of the reverance he held for him, that after death his hallowed remains might continue to defend Nisibis against its enemies. When Nisibis was yielded to the Persian monarch in 363, the Christian inhabitants carried the sacred relics with them,  which, according to the Menologion of the Armenians at Venice, were brought to Constantinople about the year 970. ↑ Antiochia Mygdonia was a Seleucid colony in ancient Mesopotamia; in the classical Roman period it was known as Nisibis; today it is the Turkish town of Nusaybin. ↑ In the Roman Catholic Church his feast day is July 15; in the Coptic Synaxarion it is held on the 18th day of the Month of Tobi (usually January 26); the Armenians observe his feast on December 15; and the Syrians on May 12 and July 15. ↑ The celebrity that Jacob acquired by the strictness of his asceticism and his spiritual gifts, caused Theodoret to assign him the first place in his Religiosa Historia or Vitae Patrum - where he is entitled "Ο μέγας" ("the great") - in which his self-imposed austerities, and the miracles of which he was the reputed worker, are fully detailed. ↑ One day as he was travelling, he was accosted by a gang of beggars who had concerted a plot whereby to impose upon the servant of God, with the view of extorting money from him on pretence to bury their companion, who lay stretched on the ground as if he had been dead. The holy man gave them what they asked, and “offering up supplications to God as for a soul departed, he prayed that his divine majesty would pardon him the sins he had committed whilst he lived, and that he would admit him into the company of the saints,” says Theodoret. As soon as the saint was gone by, his companions calling upon him to rise and take his share of the booty, were strangely surprised to find him really dead. They rushed to St. Jacob, begged him, kissed his hands and feet, confessed their evil deeds and intentions, and begged his forgiveness. As he accepted their apology and petition, he prayed for the deceased, who then rose again. ↑ Gennadius speaks of Jacob as a copious writer, and gives the titles of twenty-six different treatises of which he was the author. ↑ From 337-350, the Persian King Shapur II attacked Nisibis on three occasions, as it was the great city of Northern Mesopotamia and the bulwark of the eastern provinces. The first Siege of Nisibis took place in A.D. 338; the second in A.D. 346; and the third in A.D. 350, lasting three months. ↑ The tale of the final siege of 350, which lasted three months, and of the bishop's successful efforts to save his city, can be read in the passages of Gibbon (ch. xviii. vol. ii. pp.385ff. ), or de Broglie (L'Eglise et L'Empire, tom. iii. pp.180-195.). ↑ 1.0 1.1 Syriac Orthodox Church of Antioch: Archdiocese of the Western U.S. St. James (Jacob) bishop of Nisibis, July 15. ↑ 2.0 2.1 Sir William Smith. "JACOBUS (4) or JAMES bishop of Nisibis in Mesopotamia". In: Volume 3 of A Dictionary of Christian Biography, Literature, Sects and Doctrines: Being a Continuation of 'The Dictionary of the Bible'. J. Murray, 1882. p.326. ↑ 3.0 3.1 3.2 S. V. Bulgakov. Handbook for Church Servers. 2nd Ed. Kharkov, 1900. 1274pp. (Translated by Archpriest Eugene D. Tarris, December 13, 2006). ↑ 4.0 4.1 Antiochian Syriac Orthodox Church. 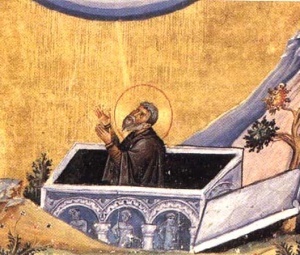 St. Jacob of Nisibis. ↑ de Script. Eccl. c.1. ↑ Greg. Nyss. Vit. Greg. Thaumat. ↑ Soz. vii. 27; Theod. u. s. p. 1112. ↑ 9.0 9.1 9.2 Christian Classics Ethereal Library (CCEL). JACOB (JAMES) OF NISIBIS. ↑ Asseman. Bibl. Or. tom. i. p.186. ↑ Labbe, Council. ii. 52, 76. ↑ Adv. Arian. tom. i. p.252. ↑ Bishop Pearson, Vind. Ignat. part i. p.187; Hefele, Hist. of Councils, v. i. p.366, Eng. Transl. ↑ Labbe, Council. ii. 559. ↑ Tillemont, Mem. Eccl. tom. vi. note 27, les Ariens; Hefele, Councils, ii, 58, Engl. Transl. ↑ cf. the Synaxarium ecclesiae Constantinopolitanae [=Propylaeum ad ASB, Novembris], ed. H. Delehaye, Brussels, 1902, Jan. 13. ↑ Sir William Smith. A Dictionary of Greek and Roman Biography and Mythology: Earinus-Nyx. Vol. 2. London: John Murray, 1880. p.547. ↑ Renaudot, Lit. Or. tom. ii. p.4. ↑ C. S. Lightfoot. Facts and Fiction: The Third Siege of Nisibis (A.D. 350). Historia: Zeitschrift für Alte Geschichte. Vol. 37, No. 1 (1st Qtr., 1988), pp.105-125. Page 123. ↑ 23.0 23.1 St. James, Bishop of Nisibis, Confessor at Bartleby.com. ↑ W. H. C. Frend. The Monks and the Survival of the East Roman Empire in the Fifth Century. Past & Present. No. 54 (Feb., 1972), pp. 3-24. Page 8. ↑ Theod. u. s. p.1119; Soz. H. E. v.3; Gennad. u. s. c.1. Christian Classics Ethereal Library (CCEL). JACOB (JAMES) OF NISIBIS. Antiochian Syriac Orthodox Church. St. Jacob of Nisibis. Syriac Orthodox Church of Antioch: Archdiocese of the Western U.S. St. James (Jacob) bishop of Nisibis, July 15. St. James, Bishop of Nisibis, Confessor at Bartleby.com. Jacob of Nisibis at Wikipedia. S. V. Bulgakov. Handbook for Church Servers. 2nd Ed. Kharkov, 1900. 1274pp. (Translated by Archpriest Eugene D. Tarris, December 13, 2006). Sir William Smith. "JACOBUS (4) or JAMES bishop of Nisibis in Mesopotamia". In: Volume 3 of A Dictionary of Christian Biography, Literature, Sects and Doctrines: Being a Continuation of 'The Dictionary of the Bible'. J. Murray, 1882. Sir William Smith. A Dictionary of Greek and Roman Biography and Mythology: Earinus-Nyx. Vol. 2. London: John Murray, 1880. C. S. Lightfoot. Facts and Fiction: The Third Siege of Nisibis (A.D. 350). Historia: Zeitschrift für Alte Geschichte. Vol. 37, No. 1 (1st Qtr., 1988), pp.105-125. Prof. T. D. Barnes. Constantine and the Christians of Persia. The Journal of Roman Studies. Vol. 75 (1985), pp. 126-136. W. H. C. Frend. The Monks and the Survival of the East Roman Empire in the Fifth Century. Past & Present. No. 54 (Feb., 1972), pp. 3-24. Nisibis (East Syrian Ecclesiastical Province) at Wikipedia. This page was last edited on October 22, 2012, at 18:07. This page has been accessed 39,944 times.